This November has provided some significantly cooler weather than we’re accustomed to, with an average monthly temperature nearly 5 degrees below normal. (A warm start will keep this month out of the top-10 coldest Novembers). However, we’ll now end the month with a string of warmer days and nights that will last into early December before a stronger cold front arrives next week. A few outlying areas are seeing lows in the upper 30s this morning, but for the most part the city has remained in the 40s or (near the coast) 50s. Winds have already shifted to come from the south, and this will bring us a steady stream of warmer, and more humid air. Highs today will reach into the low 70s, although as clouds build later this afternoon I wouldn’t expect highs to go above that. Lows tonight are unlikely to fall below 60 for most of the area. As moisture moves in from the Gulf, we’ll see a decent chance of rain to end the work week, with 30 to 50 percent chances for both Thursday and Friday. Accumulations should range on the order of one-quarter to one-half inch, with the greater amounts to the east. 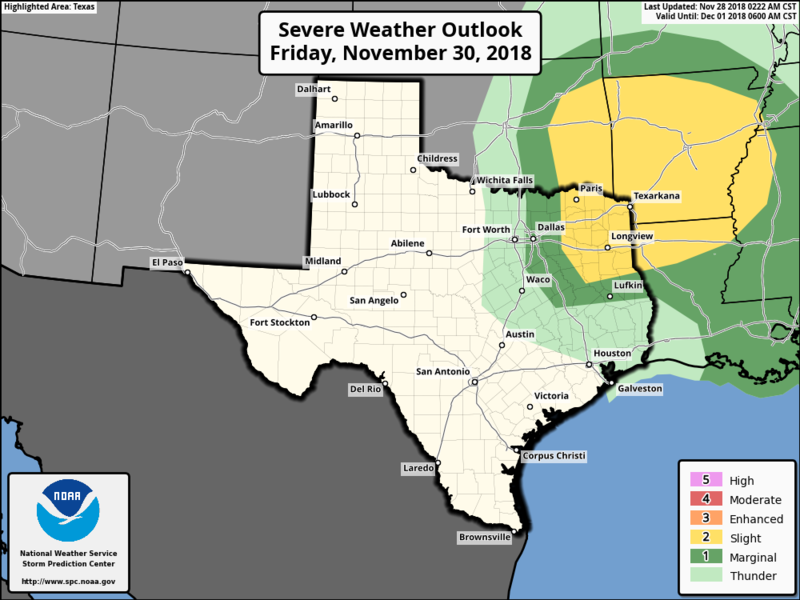 By Friday or Friday night, a cold front will drop down into Texas, and there is the potential for some severe weather, including thunderstorms. However, as of now, the dynamics for this are better for the Texarkana area (see map). Highs to end the week will be in the upper 70s to 80 degrees, with warm nights for this time of year. 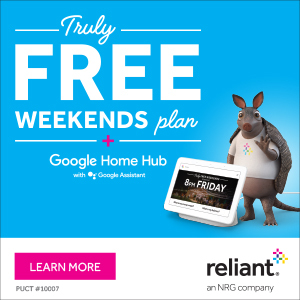 For the weekend, this day should be the pick of the litter, with highs in the mid- to upper-70s, mostly sunny skies, relatively low humidity, and light winds. Lows Saturday night will range from upper 40s for far inland areas to low 60s right along the coast. Enjoy! Friday night’s cold front washes out pretty quickly, and the onshore flow will resume by Saturday night or Sunday morning. However, we still anticipate partly to mostly sunny skies on Sunday, as highs reach into the upper 70s. We can’t rule out some rain chances later on Sunday, and Sunday night, as a much stronger cold front approaches the area. This front will push us back into a cooler, sunny pattern, with highs generally in the 60s and lows in the 40s for much of next week. Stay strong, Lee, and the 80s shall soon pass. Hooray for the upper 70s/80s! I know yall are not climatologists and nothing political here at all. Do you know if our region is not really seeing any hotter than normal high temps during the year, but we are seeing widespread increases in our low temps during the year. 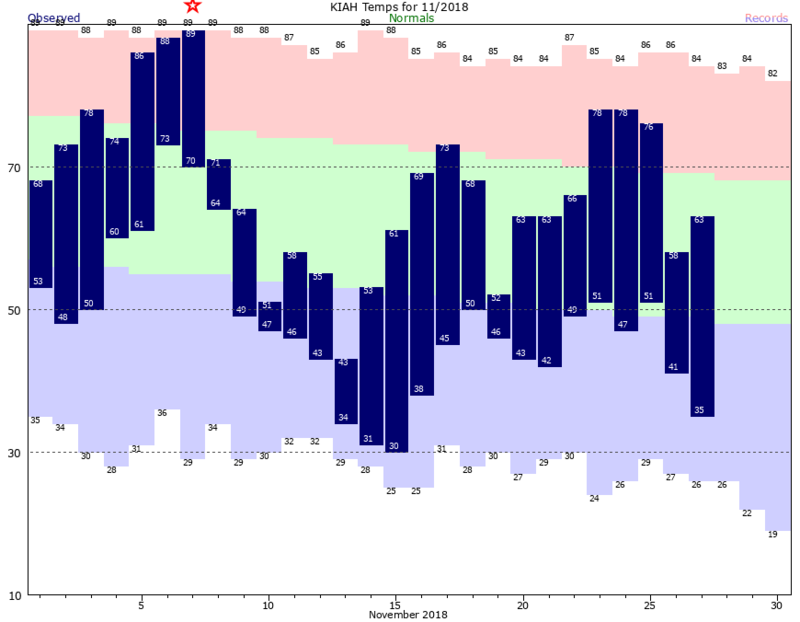 It feels like in the summer and fall the lows are often 5+ degrees above their avg and perhaps that is what is pushing us to hotter months than just higher high temps. Any knowledge on this? I agree with Lee. Yuck to 80s!!! 80 degrees in the “winter” is absurd. I’m from here. Am almost 50, so trust me, I’m used to it. Didn’t say I wasn’t, just don’t like it. Thank you for the info, Eric and Matt! I’m running an outdoor evening event next Friday evening, Eric, and I’m counting on you to prepare me for what to expect! Looking forward to hearing more about next week!